The shallowing arm movement is a whole arm activity. Some golfers try to do the correct movement with the forearms, but lose it because of what is happening at the shoulders. 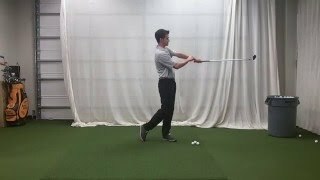 In this video, you'll see the proper shoulder blade movement to accompany a shallowing arm movement and body-powered downswing.